The death of TV as we've known it is finally here. The satellite company Dish announced plans to sell a package of channels that are streamed over the internet for $20 a month. Dish's service has 10 channels, according to The Verge: TNT, TBS, CNN, Food Network, HGTV, Cartoon Network, Adult Swim, the Disney Channel, ESPN, and ESPN2. The biggest channel in there is ESPN, as people will be able to see all the live sports programming aired by ESPN without having to sign up for a traditional pay-TV subscription. But if you really dig into the fine details on this thing, it's tremendously underwhelming. Only one person can use Sling TV to watch TV at a time. So if you want to watch ESPN and your husband wants to watch the Food Channel, you're out of luck. You'll need a streaming device like Roku to get Sling TV on your TV. Apple TV won't be compatible, at least not immediately. While ESPN is nice, the service is missing lots of channels, including local broadcasters like NBC, CBS, FOX, and ABC. Then there's the cost. If you dig into what it would cost, it doesn't look as if it will save you money. It's $20 per month. But you still need to pay for an internet connection. It's difficult to figure out the price Comcast or Verizon will really charge you for a TV-plus-internet bundle because their websites are dense and unclear. But a look at Comcast's website shows a TV-plus-internet package for $60 per month that includes 140 channels. For just internet, it's $40 per month. So the price nets out to be roughly the same. If you want to augment your TV viewing, you'll add Netflix, HBO Go, and other things, which will increase your costs. And the user experience is much worse. You have to flip from app to app to find things you want. If you really like TV, the best thing to do is subscribe to cable or fiber. However! Changes to the TV industry have to start somewhere. And this appears to be a starting point. If the big networks are willing to open up for Dish, maybe other companies — Google? Apple? Amazon? Samsung? Some startup? — will be able to take this model and figure out a way to lower prices to consumers by monetizing something else. For instance, Apple could offer free TV streaming for consumers willing to pay $4,000 for a gorgeous 65-inch 4K Apple TV. If not Apple, what about Samsung, or LG? Maybe bundle in some Netflix? Build an HD antenna right into the TV so it can deliver broadcast channels? Get the interface right, and maybe then we'd have some change. Since the internet demolished the music industry and the newspaper business, pundits have been calling TV to die a similar death. It hasn't happened. Instead, the TV industry is as strong as ever. But money is pouring into original programming from new players like Netflix, Yahoo, Hulu, AOL, and Amazon. We are in the golden age of television because of these new companies. 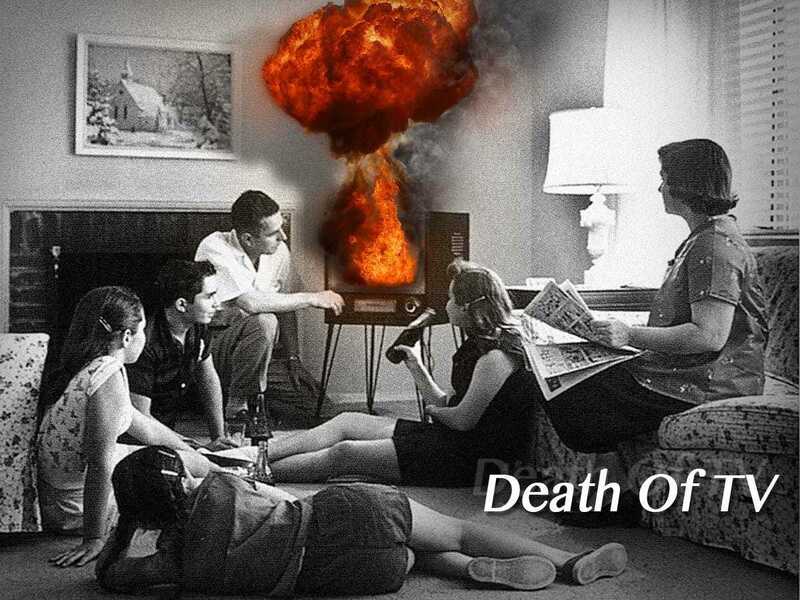 The death of TV will not actually be the end of TV programming. Instead, it will be an evolution. This deal from Dish could mark the beginning of that evolution. Revenue for digital video services like Netflix and Hulu has taken off in the last decade: It started picking up in 2007 with the introduction of the modern smartphone, but it started really taking off in 2010, the same year Apple introduced the iPad. The beneficiaries of those new device categories, however, were the big distributors of that digital content — Netflix, YouTube, and Hulu. 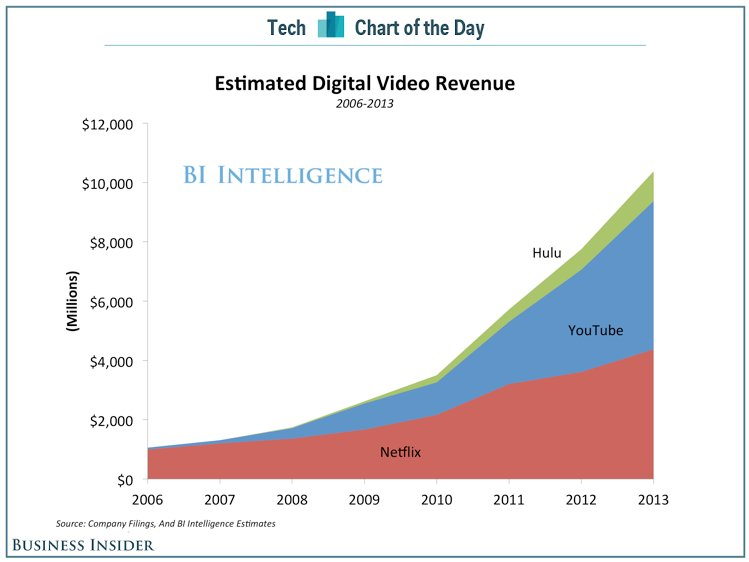 Based on company filings charted for us by BI Intelligence, YouTube pocketed an estimated $5 billion in digital video revenue in 2013 — about 31% more than the previous year — while Netflix made an estimated $4.4 billion (a 17% jump from 2012) and Hulu made around $1 billion (a 30% jump from 2012) in digital video revenue. Across the board, digital video companies and platforms can expect to see more of that revenue: Web video services — particularly YouTube’s, since it’s largely free — are significant contributors to the “cord-cutter” movement that's said to truly take hold in a decade from now, where people rely less on cable TV, or abandon it altogether, replacing it with internet-enabled devices and services.